You’ll need to wedge in another 192-page hardcover volume in your Ian Wilson series! Speed Graphics and Steam 1958! vol. 1 will arrive in May 2019, so make room for it beside its 1957 predecessor! $69.95 CAD ALL-INCLUSIVE SHIPPED TO CANADA (click button multiple times if ordering more than one copy). Indicate for whom you would like it signed, if applicable. $69.95 USD ALL-INCLUSIVE SHIPPED TO USA OR OVERSEAS (click button multiple times if ordering more than one copy). Indicate for whom you would like it signed, if applicable. For pre-ordering by mail, please navigate to our brochures page. Download and print the appropriate brochure, and kindly send the order form portion to us with payment. John Rehor, Don Wood and Herb Harwood. Now they are back in 1958—and travelling together! This time they cover TWICE as much territory—which means TWO volumes of Speed Graphics and Steam 1958! for your reading pleasure! And more! In Speed Graphics and Steam 1958! vol. 1 you’ll also renew acquaintances with many steam locomotives you met on your 1957 adventure—and several new ones! Leaving nothing to chance, he’s contacted railway dispatchers to maximize opportunities to see steam in action. In Speed Graphics and Steam 1958! vol. 1 you will benefit from Rehor’s pre-planning without having to leave your comfortable chair! 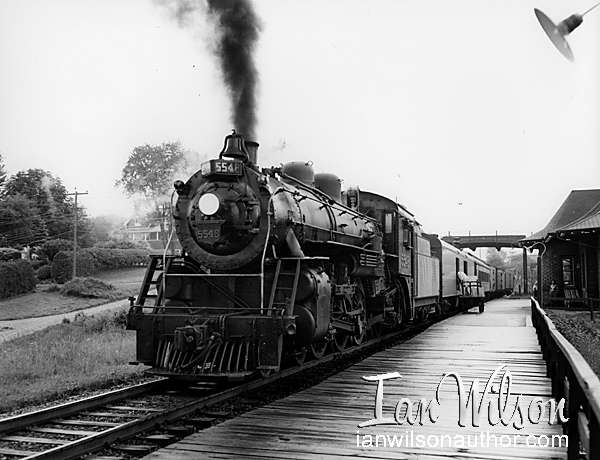 You’ll start at Windsor and work eastward through Jeannettes Creek (where you’ll even catch some Wabash action), then experience night-time at the CNR and CPR London roundhouses. 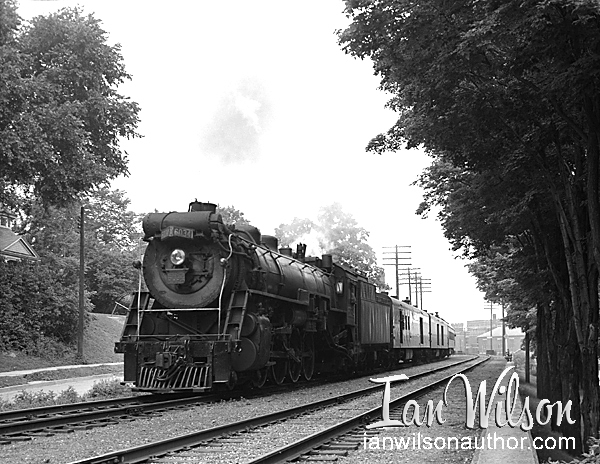 You’ll revisit St. Marys and Stratford—then head east along the CNR Brampton Subdivision as you did in 1957 (via Shakespeare, Baden and Breslau) to Guelph for a parade of steam-powered passenger trains. Then it will be up to Palmerston, via Elora and Alma. 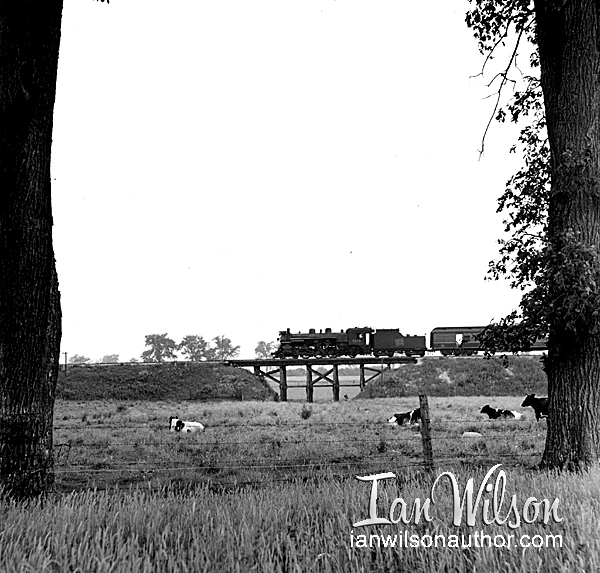 You’ll encounter trains on the CNR at Harriston again, before meeting more Ten Wheelers at Wingham and Mildmay. Then you’ll prowl the Owen Sound Subdivision from Hanover northward, before swinging southward to Listowel, Brunner and back to St. Marys. Your night will end on the platform at Stratford. 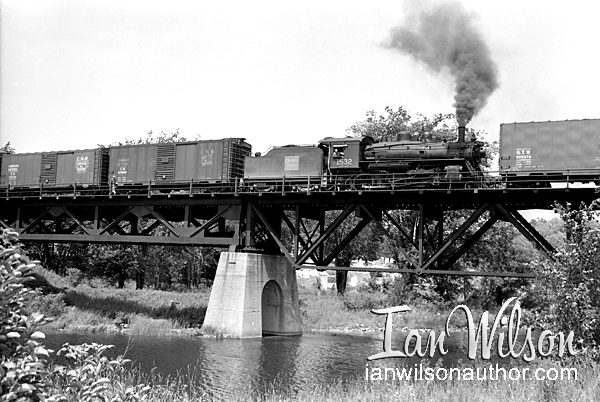 You’ll catch an eastbound CNR passenger train at Shakespeare before witnessing large power—Northern, Mountain, Hudson and Mikado classes—at Brantford. Onondaga and Caledonia will follow—where CNR 4-8-4s are finishing their careers in mixed train service. You’ll glimpse a Mikado switching the Canada Crushed Stone plant at Dundas, then behold a parade of mainline CNR and CPR trains behind steam and diesel at Bayview. Packing up, you’ll head north to Allandale—but that will wait for vol. 2! To accomplish this, your author visited Herb Harwood and pieced 50 rolls of negatives together—frame by frame—to choreograph the action you’ll enjoy in Speed Graphics and Steam 1958! vol. 1 from all three cameras! Harwood’s Canadian material has gone unexplored for decades. Aside from the photographer, your author is the only person to have laid eyes on the Harwood images exposed in Ontario. You will behold many of these undiscovered gems in Speed Graphics and Steam 1958! vol. 1. (As you read this, Harwood’s 150,000 negatives are consigned to an institution which may take YEARS to catalogue them before they are available). They expose hundreds and hundreds and hundreds of photographic negatives with their Speed Graphics. 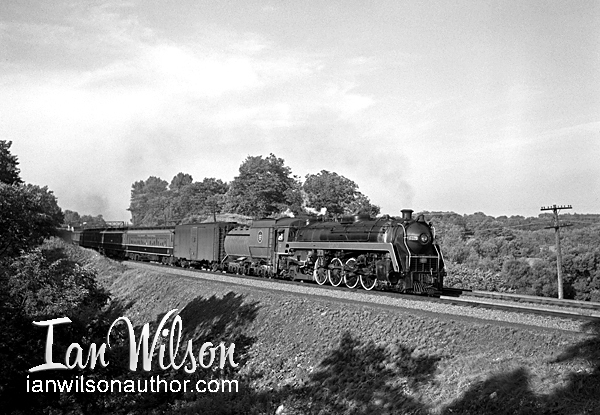 Wherever the steam locomotives are, the photographers seek them out. But they do not necessarily grasp the big picture. That’s where your author comes in, to present you with the context of the railway operations you will witness through 192 pages of Speed Graphics and Steam 1958! vol. 1. But never with a unifying narrative and moment-to-moment action. Where else in today’s world of information overload can you find that context except in this limited-edition book? Certainly not on Facebook or photo-sharing sites! And the book will be printed and bound in Ontario, Canada. As you know from previous Ian Wilson’s titles, the 80 lb. Endurance Gloss Text pages will showcase photography with the sharpness of darkroom prints. You will enjoy more than 200 images presented in the largest format possible—capturing everything from panoramic scenes to intricate details of locomotives. You’ll pore over the photographs over and over, discovering something new on every occasion! The 100 lb. laminated dust jacket will glisten on your shelf for decades, never to lose its crisp appearance! For every locale depicted, you will have a track diagram prepared from railway property plans. To enable a full picture of the operations, you will have at your fingertips sections of railway employee time tables—the same ones that govern railwaymen and your photographers. 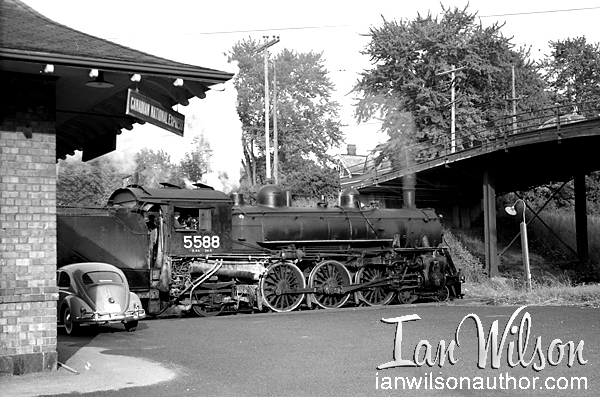 Now they’ve done that—and you can retreat to your den (or train room or man cave) to pick up the story of steam’s last full summer in Ontario. 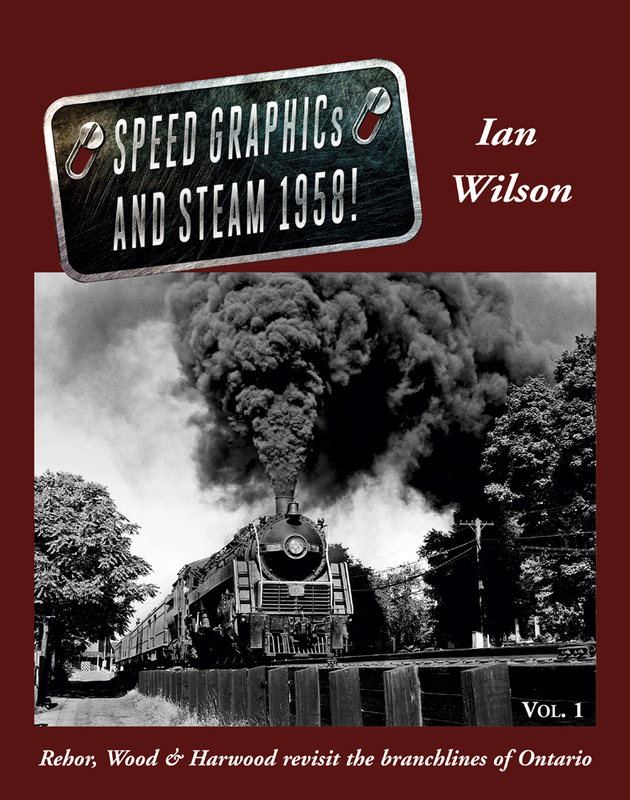 The locomotives, trains, railway lines and steam-era environment live again in Speed Graphics and Steam 1958! vol. 1. 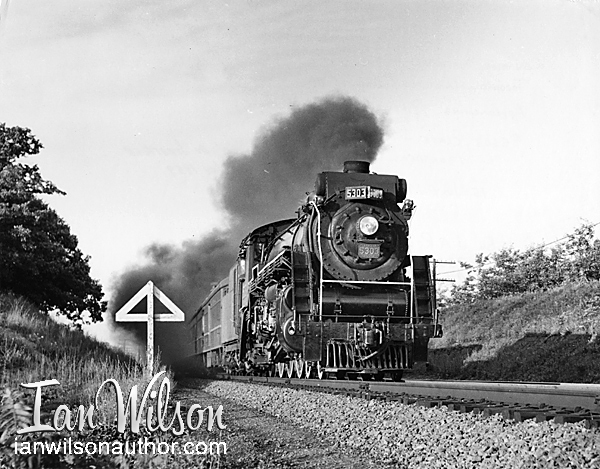 The book will be your time machine, your portal to the railway world of the past. 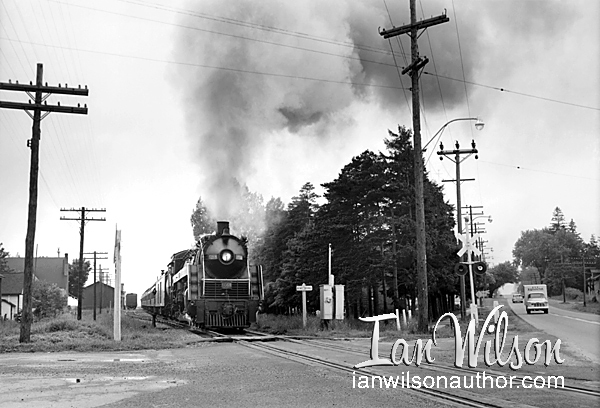 Through its pages you will walk into roundhouses full of steam locomotives, watch Pacifics and Northerns pulling away from station platforms, witness Ten Wheelers trundling way freights along branchlines. But Herb Harwood and the late Don Wood have related many anecdotes to your author (who has also studied Rehor’s memoirs). The poignant and humorous recollections of the lens men will be presented to you in the narrative accompanying their stellar Speed Graphic handiwork. 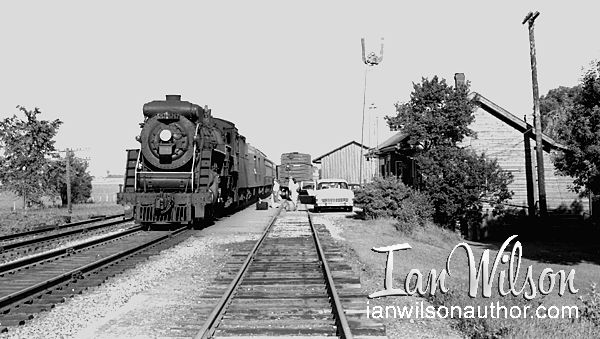 You’ll believe you’re riding in the backseat with them as your tear along Ontario backroads through Speed Graphics and Steam 1958! vol. 1. As you turn pages, you’ll anticipate action on the next spread, just as your photographers anticipate the action on the ground! After awhile, no matter how gifted the photographer, you cannot fully appreciate each image afresh. But Speed Graphics and Steam 1958! vol. 1 offers you a different experience. As you page through the volume, you’ll see a story unfolding before your eyes like a motion picture. Multiple views of locomotives and trains will impart movement and urgency. 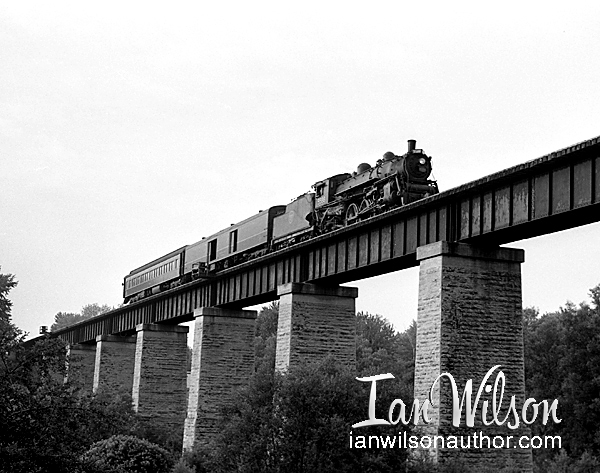 This book will be a dynamic portrayal of railway action, not a static treatment. Every time you close the cover you’ll cherish the memories contained therein as if you actually experienced them! After multiple passes, you’ll consider the book your personal scrapbook of a trip you took to Ontario with Rehor, Wood and Harwood in July 1958. 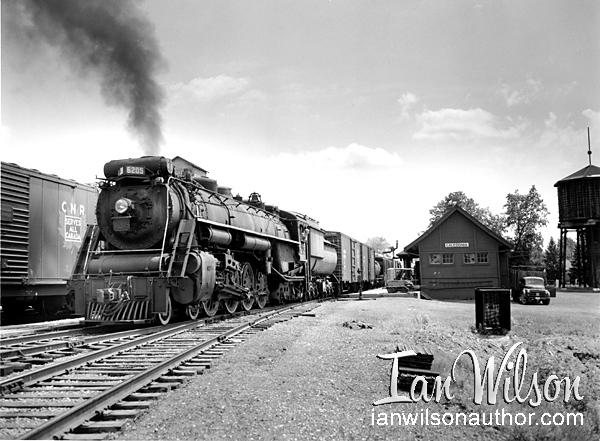 Like in July 1957, you’ll participate in a hell-bent chase to find operating steam locomotives in southwestern Ontario. It’s a race against the clock to experience steam before it slips into the eternal night. Youth and mobility are fleeting. Wouldn’t you drop everything now for the chance to be a young man in your twenties, barrelling along country roads in the backseat of Don Wood’s Dodge, pursuing trails of smoke and steam across the horizon of a 1958 summer? But you won’t have to leave your comfortable chair to enjoy steam action day and night through the pages of Speed Graphics and Steam 1958! vol. 1. Your photographers sacrifice sleep, food and comfort on your behalf to capture hundreds of images for your enjoyment—whether in the heat of the afternoon, the dew-infused morning, or the jet-black night. The setting you cannot experience today—roundhouses, stations, yards, coaling plants, water tanks, the entire envioronment against which the late steam era plays out. And onto that stage, that setting, you will behold the locomotives and trains coming forth like players. They are the actors, extinct for six decades and more, now providing you with a command performance. Have you ever lost yourself in a page-turning novel that rivets your attention, keeps you reading long into the night? Speed Graphics and Steam 1958! vol. 1. There will be a pleasing shift of tempos as you explore everything from Ten Wheelers on remote branchlines to Northerns and diesel F-units on double-tracked mainline. In many cases, the vision of the author is not transmitted onto the printed page by the book designer. For Speed Graphics and Steam 1958! vol. 1 the author and layout artist are one and the same. You'll benefit from your author’s intent conveyed as envisioned onto the printed page. Best reserve your copy now by pre-ordering! Click that button! You’ll want to avoid missing your personal copy of this second book in the landmark Speed Graphics series! The Wilson family prides itself on enjoying a first-name relationship with you, and we extend every courtesy we can to make your experience of owning Ian Wilson books a pleasant and fulfilling one! The next month—May—your copy will be en route to your mailbox! You’ll receive Speed Graphics and Steam 1958! vol. 1 direct from the author, signed and dated (and personalized in any manner you choose). 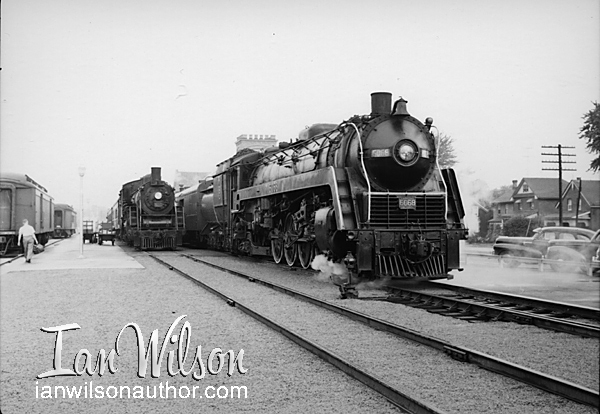 No need to seek a signature at train shows or book signings! As always, we’ll ship the books in the order we receive pre-payment. Reserve your copy NOW to be among the first in the pack to receive a signed copy! Speed Graphics and Steam 1958! vol. 1.